Plagiocephaly, also known as flat head syndrome, is when a baby has a flat spot on the back or side of the head. If you notice that your baby has a flat spot, you may be concerned. However, the good news is that plagiocephaly is usually not a major problem. Flat head syndrome is a condition characterised by a flat spot on the side or back of your baby’s head shortly after birth. It’s common, and it’s become even more prevalent nowadays. It’s also very treatable. Babies’ bones, even their skull bones, are very flexible. In fact, many baby bones are still mostly cartilage at the time of birth. If babies spend a lot of time sleeping or sitting in the same position, the backs of their heads will flatten out from pressure. Premature babies are particularly at risk for flat spots because their bones are even softer than those of a typical newborn. Why is it more common now? 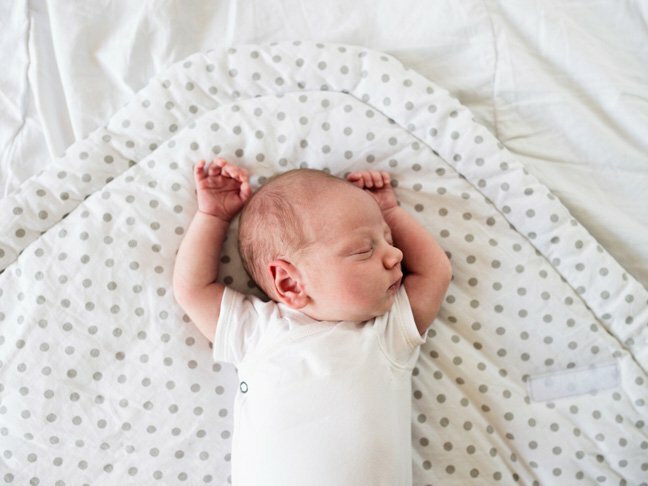 When the American Academy of Pediatrics noticed a connection between sudden infant death syndrome, or SIDS, and tummy sleeping, they launched a massive “Back to Sleep” campaign to encourage back-sleeping. After that, the number of babies with flat spots increased. Leaving babies in car seats or bouncers can exacerbate the problem. If the flat spot is detected early and parents start using repositioning techniques, it can go away on its own, provided that the baby’s bones are still moldable. Special headbands and helmets may be used, but there are some concerns that they don’t work. The key interventions here are early detection and prevention. One of the most effective treatments is to take the baby out of the car seat and hold him or her more often. A baby carrier such as a sling or classic “rebozo” can make baby carrying hands-free, and babies benefit from being close to you. Another technique is repositioning: moving your baby’s head into different positions as he or she sleeps. Most of all, practice plenty of tummy time, which will also make the baby’s neck stronger. Are there treatments without a helmet? Before using any helmet, it is crucial to see your doctor. A pediatrician may not think your baby needs one because that treatment is not universally endorsed. Depending on your baby’s needs, the doctor may suggest repositioning, tummy time and baby carrying, but he or she may also suggest physical therapy. Flat spots are pretty common. It’s understandable to be concerned, but if you see your doctor and take corrective action early, growing out of them should be no problem.